Posted in Software, Updates by RaMMicHaeL at July 25th, 2016. Thank you very much for this software and its updates, I can’t imagine my Windows without it. Is there a chance to have an option for fully transparent taskbar added to it? Thx again. Yes! I was waiting a long time for this update. I regretted going on the insider builds again the moment your program stopped working in that build. Glad to have a working version again. Was a good reason to donate some at the same time for this sweet little program. I donated, but I sill cannot download. For weeks by now. That’s pretty annoying. Same for me. I donated but can not download the alpha. Would appreciate if that could be fixed. It says “Could not send the email because of a server error. Please try again later. The following error has occurred: mail() [function.mail]: Sorry, the server has not relayed this email, more emails were sent today than allowed”. Unfortunately, the server that I’m using limits the amount of emails that can be sent every day. Therefore, the email couldn’t be sent. Try again today or tomorrow, it should work. Updated and my taskbar icons are back to being big again. Thanks! Thanks for the alpha version. Just installed it on Windows 10 Anniversary Update. Most features do indeed work. The two features that are must have for me work perfectly (middle mouse button on taskbar item to close, drag-drop rearrange task bar items). I had to work without them for 15 minutes and almost went crazy… 🙂 So far the only thing that I found that doesn’t work is ‘Display seconds on the tray clock’. Keep up the good work! This is happening to me also. Even worse, my PC hangs right after the error message shows up. Start button, Taskbar, Clock, Action Center Icon — all become unresponsive. Once they are, I cannot bypass it to access Task Manager or Settings or MSCONFIG or even the Command Line, so I could disable Taskbar Tweaker from initiating. Can not Donate from Japan in paypal. I am looking forward to the official version. Send me an email, and I’ll try to help you. Sorry, the server has not relayed this email, more emails were sent today than allowed. Need any help with testing? First thing I noticed is that the tray clock isn’t showing the seconds when that option is selected, and the time goes away completely if you hover over it. I’d also be happy to help with testing. On Windows 10 Anniversary, I get the error “Could not load Library (107)” when starting 7TT, and then my settings don’t seem to work. The option to show seconds should work on v5.1.9.2. Currently, I know that there are problems with the combining options. If you find any other issues, please let me know. Thanks! Great, the tray clock is working perfectly now. One issue I found is that tooltips never show when using the “always_show_thumb_labels” option, even if “always_show_tooltip” is enabled. Thanks, but seems like it’s not related to the Anniversary Update, the behavior is the same on older builds as well. The always_show_tooltip option has effect only when the thumbnail has no label. If it does have one, a tooltip doesn’t get displayed regardless of the option. Any chance you support tooltips when the thumbnail has a label? This would be really useful for windows with titles that don’t fit in the label, like when Explorer windows are set to use the full path. I’ll try to look at it when I have some spare time. I’m not sure when you did this, but I just noticed it after updating to 5.4, so thanks! Neither do I. Actually, it seems like the behavior was introduced in Windows 10 Fall Creators Update, and is not related to the tweaker. Windows Defender is seeing the beta file as malware. I’ve reported to Windows that it is not. ”Could not send the email because of a server error. Please try again later. Ah, just tried again – and it worked. Thank you! Windows 10 Pro, 64 Bit, Version 1607 (Build 14393.10) – No Problems so far. Thanks for Taskbar Tweaker, I can’t live without it. Could someone please confirm if the alpha version works for Windows 10 build 14393? Thanks! 7+ Taskbar Tweaker is a terrific app, but now following the Windows 10 update to build 14393.10 I am receiving a “Could not load library (107)” error. I understand you are working on the alpha version of Tweaker but I am leery about alpha and beta testing on my machines. Any idea when the full version for this new Windows build will be completed? I really enjoy the app and am looking forward to using it again. Also, is it possible to make a donation without using PayPal? I don’t have a fixed date, but I hope to get it ready in 2-3 weeks. As for the donation methods, currently there’s only PayPal and Bitcoin. Also, the List View shows black text on a white background, instead of white text on a blue background (my preference). Can you please fix this for me? Also, when do you expect to have the RTM version available? Even better, give me a shout when it’s ready. Is that caused by the tweaker, or is that an issue of Windows? Also, when do you expect to have the RTM version available? The Anniversary update for Windows 10 has broken the program! It always says “could not load library” or something like that. Please fix! This is one of my favorite programs ever. E-mail/download worked today, and v5.1.9.1 works as expected on Windows 10.1607. Thank you! Thanks, this did the trick after the anniversary update started causing “could not load library” error messages. Thank you very much – v5.1.9.1 actually works on Windows 10.1607! But I’ve encountered with the bug of “Display seconds on the tray clock” feature – if it’s enabled and I hover the mouse over the tray clock then time is disappearing completely and there is an empty space only. Thanks for the feedback. This should be fixed in v5.1.9.2. Is it possible to get access to the new alpha? It is annoying to have this program (which is GREAT) broken by the Windows 10 update. I was able to download it the next day and it worked like a charm. Thank you for your great program! I have been using it for years. Combining windows on the taskbar doesn’t seem to work anymore. Is that what you mean with “incomplete”? Yes, that’s one of the known issues. I assume that there are other minor things that require polishing. Should be fixed in v5.1.9.3, please try it. thank you for your great effort developing this amazing tool. sorry i cant make a donation. paypal isnt available in my country nor any other epayment methods. I got a question, would it be possible to move the notification button all the way to the right when “Show desktop” button is disabled? I seriously doubt because this is fixed button and your wish means it must be cuted, which is imposible in my opinion. **Could not send the email because of a server error. Please try again **later. **mail() [function.mail]: Sorry, the server has not relayed this email, **more emails were sent today than allowed. Thanks and love the product! Windows is driving me insane since it updated last week. Still not working even though I donated Friday. After I get the “Could not load Library (107)” error, my PC freezes up. Then I cannot access Settings or Taskbar Manager or even MSCONFIG to disable 7TT from loading at startup. Windows just keeps loading, and then the error shows, and then everything freezes. Please help. You can open Task Manager by using one of the hotkeys, e.g. Ctrl+Alt+Del or Ctrl+Shift+Escape. If that doesn’t help, enter safe mode. You should be able to use msconfig from there. Wow thanks for replying. Very nice of you to take the time to suggest a fix, even in the midst of what must be a busy time. I now know that although the 107 error was occurring during my Windows 10 startup, it was not the actual cause of the Windows 10 startup problem. Twas really Windows 10 that was screwing up. Classic case of a post hoc ergo propter hoc mistake. Thanks for the quick response to my email. The alpha version so far is working fine for me and I appreciate your efforts on this program. Like everyone has said, it’s beyond useful and the few days I was without it after the Windows 10 Anniversary Update were excruciating. Спасибо за отличную программу, без неё никак! У сервера дневное ограничение по количеству писем. Попробуйте снова сегодня или завтра, должно получится. Hi Michael, just wondering if it would be possible to preserve taskbar order in the next update of taskbar tweaker? The trouble is, when the option to only show open windows on the desktop you are using is selected, the taskbar order changes when switching between desktops if taskbar items are rearranged. Would be happy to donate to make this happen! It appears that the email system wont allow more sending of the alpha version today. Is there a daily limit? I just installed the v5.1.9.2 alpha of 7+ . It worked fine enlarging the taskbar icons on the Windows 10 anniversary build. I needed to run it as an administrator. How much should I donate to get alpha access? It’s up to you, according to your budget and to how valuable you find 7+ Taskbar Tweaker. There’s no minimum value, any amount is appreciated. Is it possible to not display the text (only icons) for the grouped, but not combined taskbar icons? Text is not shown for normal icons, but is displayed for the grouped icons, I’d like to see only icons without text. The displayed text of the non-combined buttons is one of the things that are needed to get fixed for the update of Windows 10. Request the donation link to be sent to your inbox again, you’ll get a different link. Allow for reordering of the messages-icon and the clock. 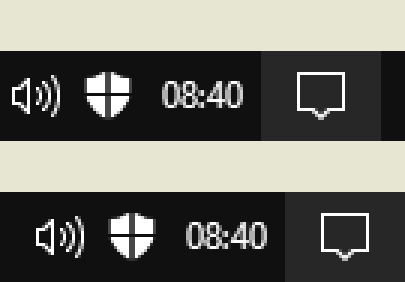 The other icons you can move around, but not the clock and chat-bubble. Annoys me that the order of these two are switched around. While i dont have the Alpha version, i do have the v5.1 version, and up untill today, it has worked well with Windows 10. But today… Windows installed an update on my PC that changed the start menu around (again….) As well as reset my video and audio options back to default….. Thanks for letting me know. These are false positives. I’ve sent a letter to the companies, hopefully the detection will be removed soon. I have a suggestion for a future release: it would be possibile to create an option for moving the “notification area” in the taskbar on the left of the clock, as it was before the Anniversary update? I prefer it that way, and it would be nice for me to have the taskbar “the old way”. Thanks and compliment for your amazing work! Well, I paid the 10 bucks to have access to the alpha version, and it doesn’t seem to combine large/labelled grouped taskbar buttons yet, which is the main reason I used 7+. I’m now using the Windows option of grouping small/non-labelled taskbar buttons, which isn’t ideal, but at least it’s consistent, and I’m starting to get used to it. I’m now wondering if I even need 7+. Why not just keep using a Windows default option without complication? First of all, thank you for the donation! The combining option should work correctly in v5.1.9.3. I’m now wondering if I even need 7+. Why not just keep using a Windows default option without complication? It’s a matter of preference and habit. Some like it one way, some like it another. Thank you. I tried using the link to the new version, and it says the account is generating too much traffic and has been disabled. I inputted my email address to see if a new link has been created, and I get a server-error message. By the way, thank you for your efforts. I’ve been using 7+ for many years, and it’s nice to have a product that provides great taskbar features that Microsoft might mimic years after the fact. Yeah, seems like it was too much traffic for Dropbox. I’ve updated the link in the email. I’ve downloaded it, but it still doesn’t work for me. I select Group by Application ID (default), and combine grouped buttons, but it still reverts to the Windows default option of combining buttons and hiding labels. The previous version of 7+ didn’t hide the labels. That’s basically why I use 7+. Have you set “Combine taskbar buttons” to “Never” in the taskbar properties? I did now, and it appears to be working. Thanks.